Keema is a meat-based dish from the Indian sub-continent. Our keema curry is made by sautéing ground meat and onions in oil, cooking them with tomatoes and chutney, and seasoning with keema curry’s characteristic blend of spices. Simply boil in bag and enjoy. Each package is 180g and arrives frozen. 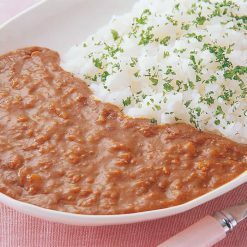 Curry is everywhere both in Japan and the Indian sub-continent, but Japanese curry and Indian curry taste very different! If you are used to eating one type, Sugarlady’s frozen meals are an inexpensive and easy way to try another type. Sugarlady’s prepared frozen foods are created with the goals of top-quality flavor and convenience, allowing you to eat well even on your busiest days. Enjoy authentic flavors from all over the world in the convenience of your own home! To prepare the keema curry, place it (still in its bag and still frozen) into an ample quantity of boiling water. Cook for 10 to 12 minutes. If the bag touches the rim of the pot, or if the bag is sticking out or hanging out of the pot, the bag can melt and develop holes. Please boil with care. Will be very hot after cooking. Please use caution to avoid burns. 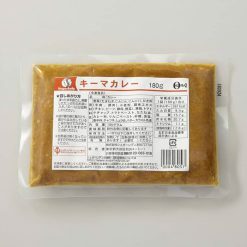 This product contains vegetables (onions, carrots, garlic), ground meat (beef, pork), wheat flour, flavoring extract (chicken, beef, yeast, vegetables), pig fat, tomato ketchup, tomato paste, rapeseed oil, curry powder, apple paste, sugar, table salt, spices, chutney, soy sauce, butter, caramel colorants.. This product is not suitable for anyone with allergies to milk, wheat, beef, soy, chicken, pork or apple. Origin of ingredients: onions (domestic), carrots (China). Prepared and packaged in Japan.